Abimannan, P., Rajendran, V. (2016). Synthesis of 1-(isopentyloxy)-4-nitrobenzene under ultrasound assisted liquid-liquid phase-transfer catalysis. Iranian Journal of Chemical Engineering(IJChE), 13(3), 54-62. Pachaiyappan Abimannan; Venugopal Rajendran. "Synthesis of 1-(isopentyloxy)-4-nitrobenzene under ultrasound assisted liquid-liquid phase-transfer catalysis". 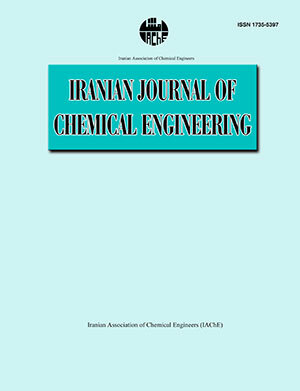 Iranian Journal of Chemical Engineering(IJChE), 13, 3, 2016, 54-62. Abimannan, P., Rajendran, V. (2016). 'Synthesis of 1-(isopentyloxy)-4-nitrobenzene under ultrasound assisted liquid-liquid phase-transfer catalysis', Iranian Journal of Chemical Engineering(IJChE), 13(3), pp. 54-62. Abimannan, P., Rajendran, V. Synthesis of 1-(isopentyloxy)-4-nitrobenzene under ultrasound assisted liquid-liquid phase-transfer catalysis. Iranian Journal of Chemical Engineering(IJChE), 2016; 13(3): 54-62. 1Department of chemistry, Pachaiyappa&#039;s College for Men, Kanchipuram, India. In this paper, we report the reaction of isoamyl alcohol and 1-chloro-4-nitrobenzene was carried out in a batch reactor under aqueous-organic biphasic conditions using the techniques like phase transfer catalysis and ultrasound irradiation. Tetrabutylammonium bromide (TBAB) was employed as the phase transfer catalyst. The reaction is greatly enhanced by adding a small quantity of phase-transfer catalyst under ultrasound (28 kHz, 300W). Detailed kinetics of the etherification was investigated. The rate constants were determined by varying the concentration of the catalyst, stirring speed, the concentration of alcohols, temperature, different solvents, concentration of sodium hydroxide, different inorganic salts and different phase transfer catalysts. From the detailed kinetic study, the optimum reaction conditions to produce higher yield of 1-(isopentyloxy)-4-nitrobenzene was obtained. The experimental data were well described by the pseudo-first-order equation. The individual experiment was carried without ultrasound; the obtained kapp value is 0.0094 min-1. The combination of ultrasound and stirring; the kapp value is 0.0178 min-1. From the observed results, the kapp value for ultrasonically promoted reaction is almost two fold higher than the normal reaction. Sasson, Y. and Neumann, R., (1st ed.) Handbook of Phase Transfer Catalysis. Blackie Academic & Professional. London, UK. (1997). Starks, C. M. Liotta, C. L. and Halpern, M., Phase Transfer Catalysis, Fundamentals, Applications, and Industrial Perspectives. Chapman & Hall Inc.: New York, (1994). Balakrishnan, T. and Damodar kumar, S., "The kinetics and mechanism of induced thermal decomposition of peroxomonosulphate by phase transfer catalysts", J. Chem. Sci., 112, 497 (2000). Vivekanand, P. A. and Balakrishnan, T., "Kinetics of dichlorocyclopropanation of vinylcyclohexane catalyzed by a new multi-site phase transfer catalyst", Catal. Commun., 10, 687 (2009). Zhao, Q. Sun, J. Liu, B. and He, J., "Anion exchange cycle of catalyst in liquid–liquid phase-transfer catalysis reaction: Novel autocatalysis", Chem. Eng. J., 262, 756 (2015). Dubey, S. M. and Gogate, P. R., "Ultrasound Assisted Synthesis of 4‑Benzyloxy-3-methoxybenzaldehyde by Selective O‑Alkylation of Vanillin with Benzyl Chloride in the Presence of Tetrabutylammonium Bromide", Ind. Eng. Chem. Res., 53, 7979 (2014). Luche, J. L., Synthetic Organic Sonochemistry, Plenum Press, New York, (1998). Loupy, A. and Luche, J. L., in: Y. Sasson and R. Neumann, Handbook of Phasetransfer Catalysis. Blackie Academic & Professional, London, pp. 369–404 (1997). Entezari, M. H. and Shameli, A. A., "Phase-transfer catalysis and ultrasonic waves I. Cannizzaro reaction", Ultrason. Sonochem., 7, 169 (2000). Wang, M. L. and Rajendran, V., "Ultrasound assisted phase-transfer catalytic epoxidation of 1,7-octadiene – A kinetic study", Ultrason. Sonochem., 14, 46 (2007). Wang, M. L. and Rajendran, V., "Kinetics for dichlorocyclopropanation of 1,7-octadiene under the influence of ultrasound assisted phase-transfer catalysis conditions", J. Mol. Catal. A: Chem., 273, 5 (2007). Li, J. T. and Li, X. L., "an efficient and practical synthesis of methylene dioximes by combination of ultrasound and phase transfer catalyst", Ultrason. Sonochem., 14, 677 (2007). Abimannan, P. Selvaraj, V. and Rajendran, V., "Sonication effect on the reaction of 4-bromo-1-methylbenzene with sodium sulfide in liquid–liquid multi-site phase-transfer catalysis condition – Kinetic study", Ultrason. Sonochem., 23, 156 (2015). Abimannan, P. and Rajendran, V., "Phase transfer catalysis for the synthesis of ethyl 2-(4-Nitrophenoxy)Acetate under sonication- kinetic aspects", IJChE., 13, 80 (2016). Abimannan, P. and Rajendran, V., "Synthesis of Diethyl 2,2'-(1,3-phenylenebis(oxy))diacetate Under a Multi-site Phase-transfer Catalyst and Ultrasound Irradiation in Solid-liquid Condition", Chem. Sci. Rev. Lett., 4, 474 (2015). Yang, H. M. and Liu, H. C., "Kinetics for synthesizing benzyl salicylate via solid–liquid phase-transfer catalysis", Appl. Catal. A: Gen., 258, 25 (2004). Nitroanisole Using 18-Crown-6 as Catalyst", Indian Chemical Engineer. (2015). DOI: 10.1080/00194506.2015.1064791. Baj, S. Sisewniak, A. and Bijak, K., "Synthesis of peroxyesters in tri-liquid system using quaternary onium salts and polyethylene glycols as phase-transfer catalysts", App. Catal. A: General. 437, 184 (2012). Yang, H. M. and Lin, D. W., "Third-liquid phase-transfer catalyzed esterification of sodium benzoate with novel dual-site phase-transfer catalyst under ultrasonic irradiation", Catal.Commun., 14, 101 (2011). Yadav, G. D. and Desai, N. M., "Phase transfer catalysed alkylation of 2_-hydroxy acetophenone with 1-bromopentane: Kinetics and mechanism of liquid–liquid reaction", J. Mol. Catal. A. Chem., 243, 278 (2006). Wu, H. S. and Lai, J. J., "phenoxide allylation in a phase-transfer catalytic extraction system", Ind. Eng. Chem. Res., 34, 1536 (1995). Halpern, M. Sasson, Y. and Rabinovitz, M., "Hydroxide Ion Initiated Reactions under Phase-Transfer Catalysis Conditions. 6. Dehydrobromination of (2-Bromoethy1)benzene via Slow Hydroxide Ion Extraction", J. Org. Chem., 49, 2011 (1984).